Mary and Peter. along with their dog, discover ancient scrolls that transport them back in time to important biblical periods. 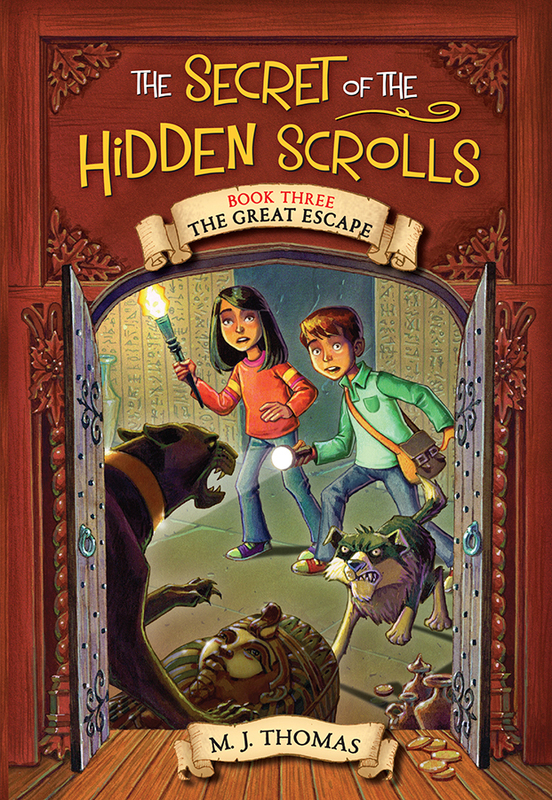 In the Great Escape, Mary and Peter go on a journey to ancient Egypt. They become friends with the Pharoah's daughter and witness Moses' petition to Pharaoh for the the freedom of the Israelites. Plagues are wreaking havoc as they try to decipher the scroll. They get chased by a panther and battle Pharaoh's advisor, the Great Magician. This book is part three of the Secret of the Hidden Scrolls book series. This book, along with others in the series, is an exciting adventure for young readers aged 6-9. It puts a mysterious twist on the bible readings and helps them to understand the stories in an easy to relate way. Mike Thomas grew up in Florida playing sports and riding his bike to the library and an arcade named the Cosmic Cowboy. He graduated from Liberty University, earning a bachelor’s degree in Bible Studies. When his son Peter was nine years old, Mike went searching for books that would teach Peter about the Bible in a fun, imaginative way. Finding none, he decided to write his own series. Mike Thomas lives in Tennessee with his wife, Lori; two sons, Payton and Peter; and their dog, Hank. You can learn more about this book by visiting Worthy Publishing. Disclosure: I received a copy of this book from Worthy Kids/Ideals to review for my honest personal opinion. Your opinion may differ. Chatty Patty's Place is not responsible for prizes that are not fulfilled by sponsors.